BPA free, stainless steel, insulated food jar with a spoon in the lid for convenience. 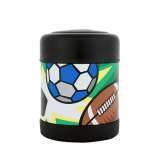 Contents kept warm for 7 hours or cold for 9 hours, meaning it stays fresh and at a safe temperature for safe consumption. Purple colour, 16oz/ 470ml. 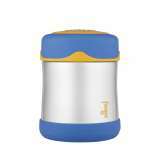 Thermos King stainless steel double wall insulated food jar in midnight blue with built-in storage compartment & folding metal spoon. 470ml capacity.